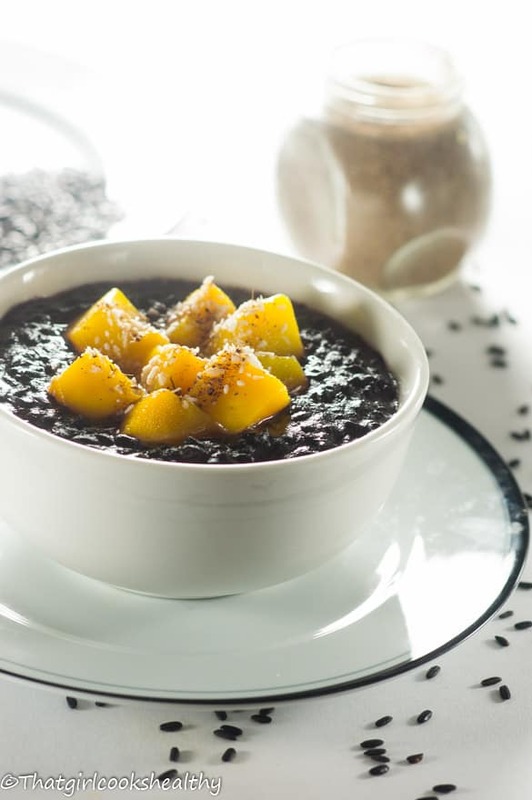 Cardamom black rice pudding – don’t let the dark hue fool you this creamy black rice pudding with a hint of cardamom is packed with essential vitamins. A few weeks ago I was browsing through my Twitter feed and came across a rather intriguing foodie picture from a fellow tweeter. It was the type of culinary picture that just instantly catches your attention at first glance, unforgettable would be the best description. While I don’t recall the recipe that was directly linked to the picture I know one thing for sure is that it contained black rice. Coming from a Caribbean background black rice is an anomaly, almost a alien concept, but the foodie within me sparked my curiosity further. 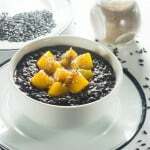 Although I was already aware of the existence of black rice I never thought about creating some cardamom black rice pudding. I grew up on brown and white rice so black rice wasn’t even on the cards, this rice with a dark/purplish hue derives from Asia. 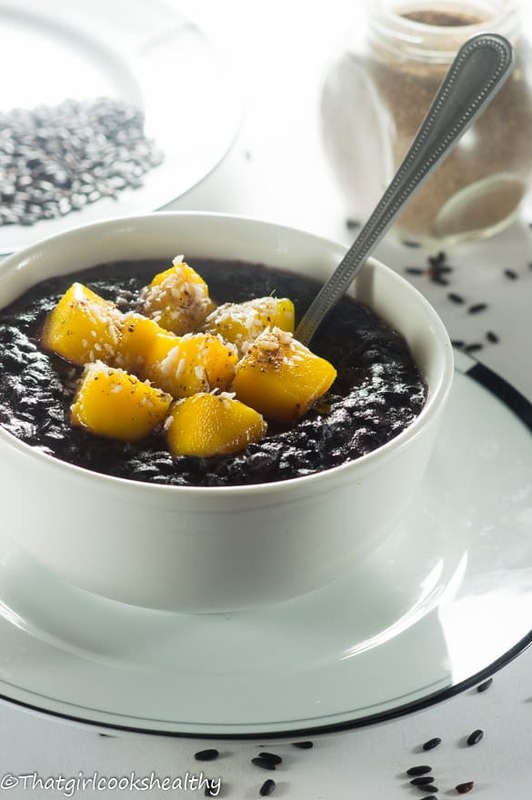 It was once know as forbidden rice as it was only eaten by Chinese royalty, over time things have changed and you’ll find many Asian countries consuming black rice quickly made it’s way to the western hemisphere. I found a reasonable sized bag at my local health store. If you cannot source it locally Amazon will most likely be the best place to purchase it from. The good thing about black rice is that is it totally gluten free (the binding protein agent found in barley, wheat and rye). Rather its deep hue attributes to it’s high levels of antioxidants which are responsible for fighting free radicals that can cause cancer. 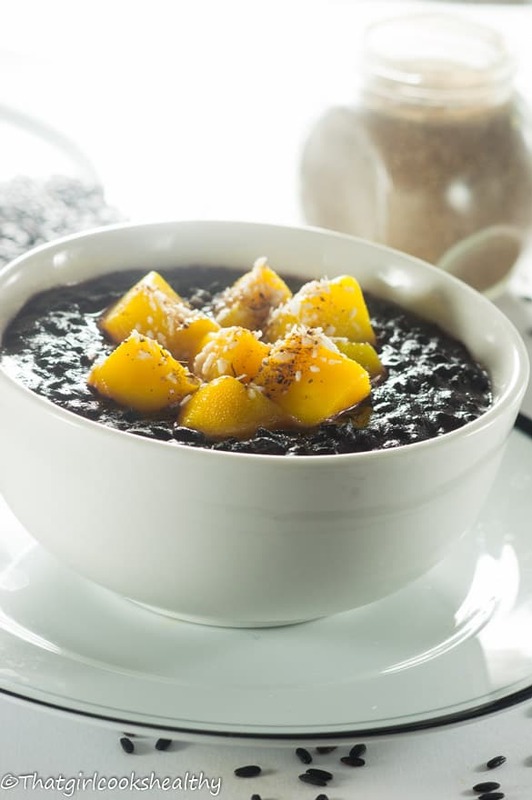 The protein levels in black rice is astronomical in comparison to white, brown, and even wild rice. That’s something to really take note of it you’re serious about your protein consumption because black rice is a great option. 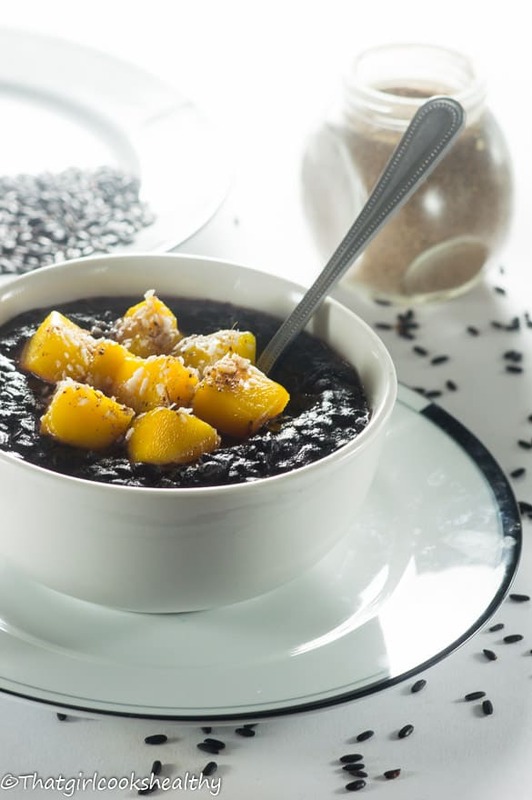 Along side the antioxidant properties it’s also anti inflammatory, detoxifies the body via the expelling toxins from the liver and is full of fiber and vitamin E.
I cannot tote this rice enough, but need to leave some room to discuss this cardamom black rice pudding recipe to hand. Now the secret to creating the right texture for black pudding is to cook the rice first with water and then add your coconut milk. Unlike white rice – brown, black and wild rice all contain the hull and bran which is an added nutrient and also extends the cooking time. I tested this cardamom black rice pudding recipe with my mother several times because she is the queen at making rice pudding. If get the pass from mom then it’s safe to share with you guys. The secret to creating a good recipe pudding is in the softness of the rice, don’t just dump all of ingredients into the pot and leave it to simmer…NEVER do that! Rice with the hull and bran intact needs a bit of TLC, what I mean is that a large volume of water is needed in order for the rice to soften, by adding the coconut milk towards the early stages of cooking would result in a loss of flavour from having to constantly replenish the pot with water. 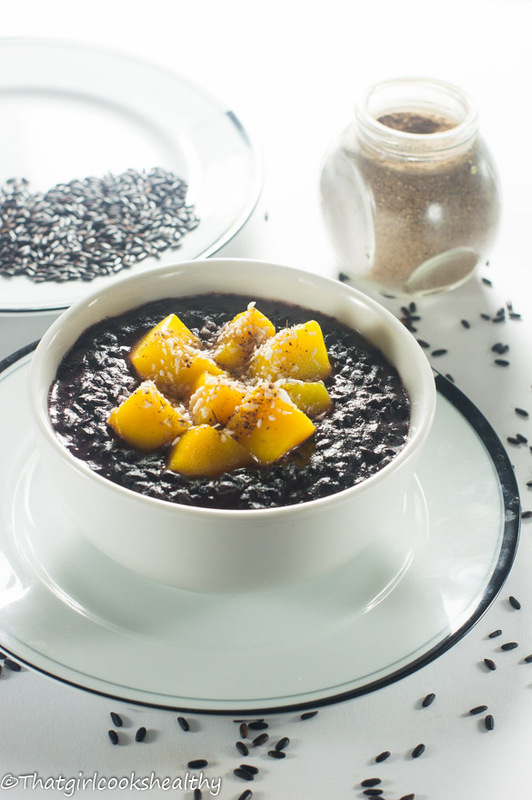 How much water is need to make cardamom black rice pudding? How much water is needed really depends, we can start out with a baseline (see the recipe guidelines) and top up accordingly. The main thing is to keep the rice moist with a suffice amount of water and once the rice is cooked through then add your coconut milk, cardamom and sweetener to taste. I found the rice softened around 40 minutes into cooking and only then did I stir in the rest of the ingredients and simmer for a further 15-20 minutes. For best results the rice should be left to soak overnight, this will increase the softness even further. 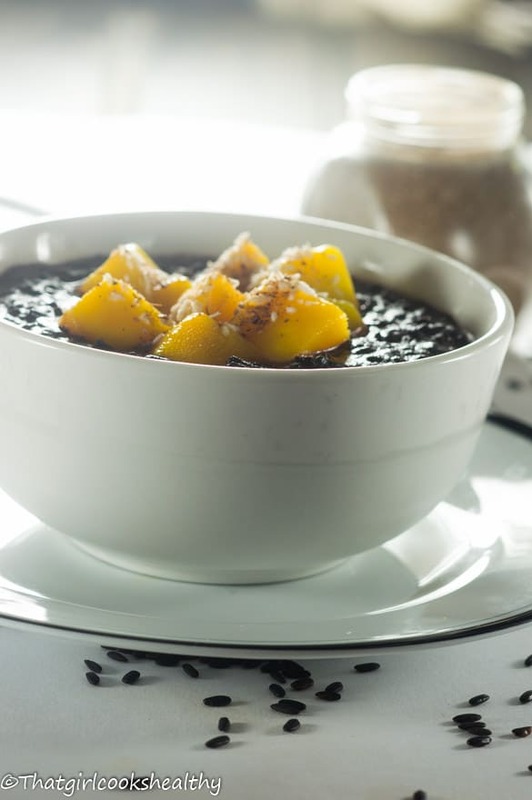 Cardamom black rice pudding can be eaten for breakfast or after dinner, there’s no set rule so don’t be swayed by the name. The next day, rinse off the water from overnight and add the 2 cups of water to the pan. Bring the black rice with water to a boil, before covering on low heat. Allow the rice to simmer for an hour, throughout this time check the water levels periodically adding 1/4 cup a water at a time if needed. Around 30-40 minutes into cooking, the rice should have drastically softened. This the perfect time to stir in your coconut milk, along with the cardamom, pink salt and vanilla. Leave to simmer (stir a few times) on medium/low heat for a further 15-20 minutes until most of the coconut milk has evaporated. The texture of the rice pudding should be soft, with liquid similar to risotto. Oh em gee. Charla… now i want to get some black rice. You are right, this is an anomlay. Rice “supposed” to be white.. lol. I agree, rice pudding is a labor of love. Oh so intrigued with this rice lol. I can honestly say I have never had this. If I did, it would surely want to look like this! Thank you! I did a lot of playing around with the lighting. Yes black rice is intriguing, definitely add some to your diet, so worth it. I LOVE Rice pudding!! But Black rice is way healthier! Clever Clever to make it this way! Dessert for Breakfast Lunch and Dinner! Thank you! That’s the beauty of this recipe, you can eat it whenever you see fit.